Every year we (at Paper Bicycle) do COUNTLESS numbers of snowmen, snowflakes, and Christmas / Winter themed icons and projects for people. Christmas seems to be our number 1 business, always. I am not surprised. I am totally one of those people that gets super excited about Christmas every single year and collects ornaments and Vintage Christmas cards every chance I get. This pattern is a special one to me. The VERY FIRST pattern I ever made with a snowman in it was one I did for my very first design job out of college. (It was also one of my very first patterns ever!) 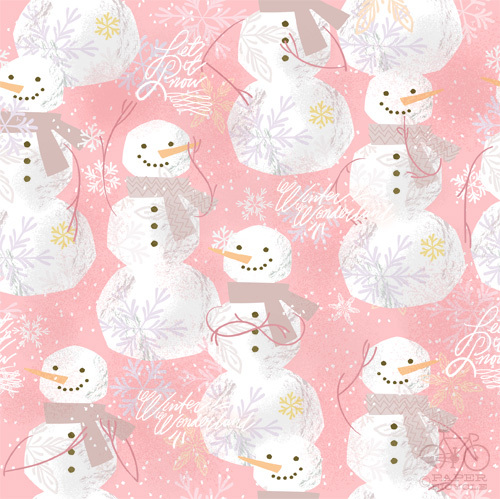 I did a super girly, pink snowman pattern. This one is a a throwback to the days of olde! Yeah, pink snowman! You'll forever be in my heart. Daily Pattern: Boxers or Briefs? Daily Pattern : Who, Me?